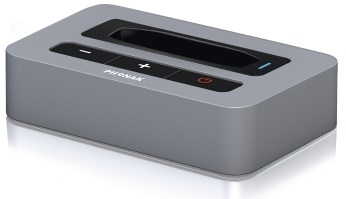 The Phonak TVLink S basestation is the Bluetooth transmitter that turns any Phonak wireless hearing instrument into a lightweight wireless headset. It wirelessly sends audio signals from the TV or any other audio source to the ComPilot within a range of up to 30 meters (100 ft.). StereoSound provides a great listening experience as well as a short transmission delay ensuring listening pleasure even for open fittings.